BUFFALO, N.Y. -- The University at Buffalo women's soccer team (7-1-0, 1-0-0 MAC) used a season-best five second half goals to earn their seventh straight victory and open Mid-American Conference play with the dominant 5-0 victory over Northern Illinois on the road on Friday night. The Bulls scored three goals within 53 seconds early in the second half, marking the quickest three goals scored in a match in the NCAA since 2005 when Notre Dame netted three goals in 51 seconds. The Bulls had their first dangerous chance of the match in the 13th minute as Marcy Barberic ripped a shot that rang off the cross bar and was cleared out of the Huskies zone. Marcy Barberic continued to pressure the Huskies in the 20th minute as she took a shot that was stopped by the NIU keeper to keep the match scoreless. The Huskies were able to notch a pair of scoring chances in the 39th and 41st minute of play as Abby Gregg took a pair of shots that were both rejected by Emily Kelly to send the match to halftime knotted, 0-0. Buffalo didn't waste anytime getting on the scoresheet in the second half as in the 49th minute, Kaitlyn Walsh was able to find the loose ball and bury her third goal of the season. Gurjeena Jandu and Rebecca Bramble earned the assists on Walsh's goal. 38 seconds later, the Bulls were able to net their second goal of the match as Marcy Barberic took a Gurjeena Jandu feed and went in all alone on goal and beat the NIU keeper for her fifth goal of the season. Buffalo then netted their third goal in 53 seconds as Carissima Cutrona took the long pass from Rebecca Bramble and buried her sixth goal of the season from just inside the 18-yard box. In the 61st minute, Carley Zoccali had a scoring chance but MacKenzie Lee made a nice stop to keep the score 3-0 in favor of the Bulls. After some back-and-forth play, the Bulls were able to make the score 4-0 in the 76th minute as Gurjeena Jandu sent a great corner into the box where Tess Ford was able to gather the ball and bury her third marker of the season. Buffalo finished off the scoring in the 89th minute of play as junior Carley Zoccali was able to find the loose ball after a Taylor Caridi free kick and bury the first goal of her UB career. The five-goal effort for the Bulls marks the most goals scored in a MAC match since October 15, 2004 when the Bulls defeated Toledo 5-2. With the win, Buffalo has now won seven straight games in regulation for the first time in program history. The Bulls are now just one win shy of tying the school record for consecutive wins which they set in 2014 when they won eight straight matches en route to their first MAC Tournament Championship in program history. With the win, the Bulls now own the 10-9-3 record all-time against the Huskies. The Bulls are 2-1-2 against Northern Illinois since head coach Shawn Burke took over the program in 2014. Junior Carley Zoccali picked up her first career goal in the win on Friday night. The goal also marked the first career points for the junior. Senior Carissima Cutrona netted her team-leading sixth goal of the season as she has now recorded at least one point in each of the Bulls' seven games during their winning streak. She has also notched multiple points in six of those seven matches for the Bulls. Sophomore Kaitlyn Walsh continued her great play as she netted her career-high third goal of the season in just her fifth game. Walsh's goal was also her first career game-winner. Sophomore forward Marcy Barberic netted her career-best fifth goal of the season as she has now notched points in three straight matches for the Bulls. Her 13 points on the season are also a career-high. Freshman defender Tess Ford recorded her third career goal on Friday, all of which coming off of set pieces for the Bulls. 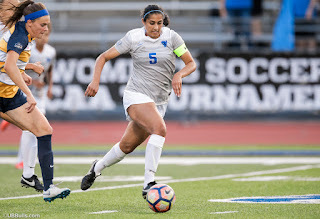 Junior captain Gurjeena Jandu finished off her night with a career-high three assists as she became the first player to notch three assists in a match since Shawn Burke took over the program in 2014. Rebecca Bramble notched a career-best two assists in the win for the Bulls, marking just the third multi-point matcher of her UB career. Senior Meghan Simmons picked up an assist on Tess Ford's goal, marking the first point of her UB career. Freshman Taylor Caridi earned the first point of her UB career, an assist, on Carley Zoccali's goal. For the match, the Bulls held the 18-2 edge in shots including the dominant 11-0 edge in the second half in which they scored five goals. Marcy Barberic led UB with six shots in the win. Freshman goalkeeper Emily Kelly finished off her match with two saves as the Bulls notched their fifth clean sheet of the season. Head coach Shawn Burke: "We are obviously very pleased with the players response after halftime. To come out with that much conviction and so have so many different goal scorers is always nice. A lot of players were able to contribute tonight and we will need that going forward." Following the match, the UB coaching staff selected Mairead Martin as the Player of the Match after her strong performance in the MAC opener against NIU. The Bulls will stay on the road on Sunday afternoon as they head to Kalamazoo, MI for a showdown with the Western Michigan Broncos. Kick is set for 1:00 pm on Sunday.